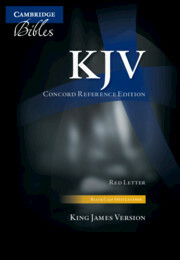 The KJV Concord Reference Edition was originally published in the 1950s and is highly regarded for its accuracy and clarity. The main text uses the Times Semi-Bold typeface, exceptionally clear and easy to read, with generous line spacing. Bold-figure cross-references link passages of the text without cluttering the page, and the Concord also features pronunciation marks for names and places. The Concord Edition opens with the translators' preface and at the back is the reference material – a glossary, concordance, dictionary of names and phrases, and fifteen colour maps. There is also a presentation page and family record section. 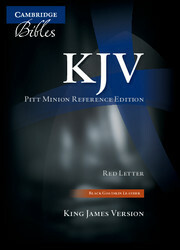 The Bible uses black-letter text throughout and is printed on India paper with gilt edges. It is bound with two ribbon markers in attractive calf split leather.